First, for our purposes of real estate, a short sale is someone selling their home for less than what they owe. Loss of job, Death of a Spouse or significant other are the two main reasons why a bank would even consider such a thing. But there are other financial hardships that could be reason for a short sale, if you have questions or would like to discuss your situation please call me. 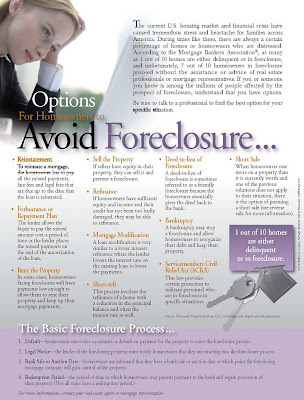 Avoiding foreclosure. Many banks will lose a lot of money if they have to foreclose on a home. 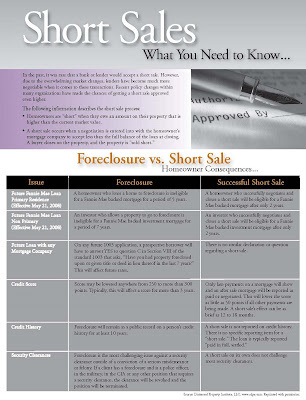 By negotiating a short sale they can save themselves thousands of dollars, and instead of tarnishing your credit with a foreclosure your lender looks at it as a "settlement of debt." Statistics show that 70% of homeowners facing foreclosure or who are in danger of losing their home never contact a real estate professional for help!! * There is help out there and many banks are working with homeowners to either modify or short sale their homes. If you, or someone you know, is in need of assistance please call me, I'm here to help! *Short selling can have major tax implications. Be sure to consult a licensed attorney or tax professional for all possible consequences. Hope Everyone had a safe and Happy holiday! Happy Independence Day America!